At the top of the screenshot, you see the tail end of the 20(!) 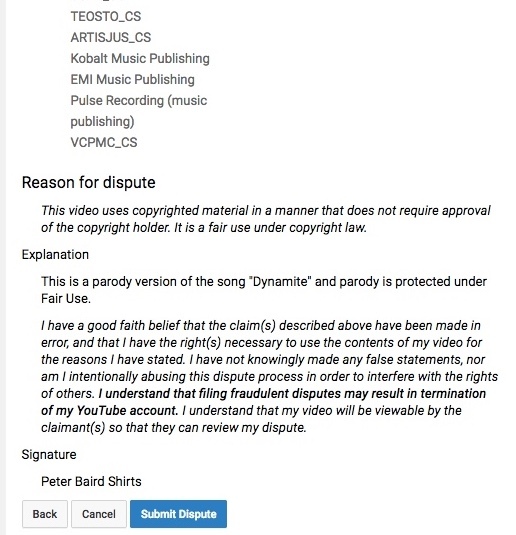 organizations that have a copyright claim on “Dynamite.” Also, note the threatening language of terms and conditions. • The copyright owner might disagree with your dispute. • The reason you gave for disputing the claim may have been insufficient or invalid. 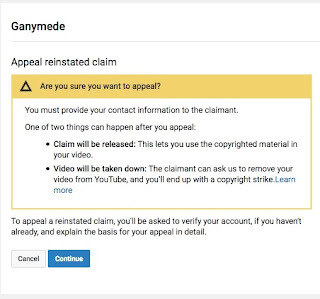 In other words, the publisher itself (notice the official copyright claimant has changed from EMI to Sony ATV—Sony ATV owns EMI publishing, but I'm not sure why the initial claim when through as EMI and then changed during the dispute) made the sole legal judgement about the Fair Use of their own intellectual property. There is no outside or impartial judge making these decisions—the publisher has all the power. So unless the publisher decides that the music used is a completely different composition (and maybe not even then), they have no incentive to grant the appeal. Further, though I needed to give a reason for the dispute, they didn’t even need to give a reason why the dispute was turned down. 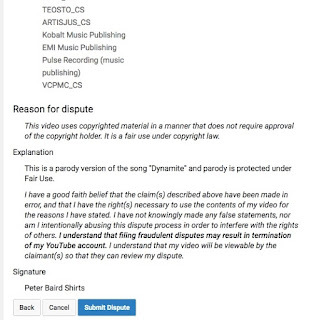 I think it is very possible Sony ATV didn’t actually watch the video—instead, they probably researched the person who filed a dispute (me) to see if they had a lawyer. The whole process is fishy, but YouTube probably agreed to the process for two reasons: 1) it is two expensive to hire their own lawyers to handle the appeals, and 2) the publishers have the financial power to slap YouTube with a very expensive lawsuit, whether right or wrong, and YouTube would rather be making money on the videos. If I appeal, there is no option of keeping the video up—either I win and the video stays up without monetization, or it gets taken down. But for the publisher, the decision is exactly the same the second time around—and since I don’t have a lawyer, there is still no incentive for the publisher to do anything but deny my claim again. As I would prefer to have my video up, making a very small amount of money for Sony ATV, I’m not planning on doing filing a second appeal. I think the answer to this needs to come from a parody that actually does generate a substantial amount of income. And there would need to be a counter suit. The other option for you is to post on different video sharing platforms.